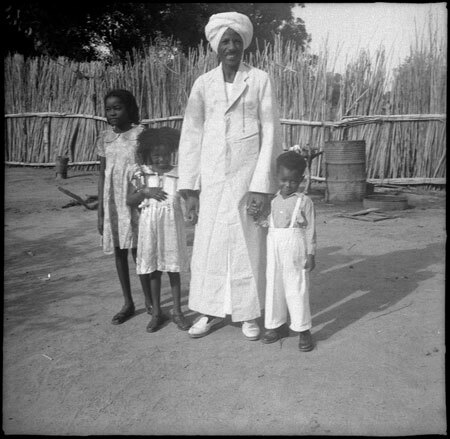 A man wearing a long light tunic and turban posing for the camera in his homestead, holding the hands of two of his children, with another older daughter standing beside them. Morton, Chris. "Family portrait in Mandari" Southern Sudan Project (in development). 03 Jan. 2006. Pitt Rivers Museum. <http://southernsudan.prm.ox.ac.uk/details/1998.97.203/>.